Yesterday, I was praying and working on the next post in our financial rebirth series. As I was writing, the Lord gave me this prophetic word about your finances to share. I believe it will bless you! I heard the Lord tell me: “Pray specifically about your finances every day. If you were a soldier keeping watch over your castle, you wouldn’t go out only every other day to watch for enemies. You would report to your post daily at the appointed time, and you would watch attentively and keenly for any approaching enemies. I want you to pray about your finances just as diligently as a soldier keeps watch over his castle. A rich man’s wealth is his strong city (Proverbs 10:15a). If you want to be a rich person, you have to think like a rich person. You don’t have to love money to do this. I would never want you to love money, for the love of money is the root of all evil (1 Timothy 6:10). But I give wealth to you to be a blessing. Wealth IS a blessing. But remember that the thief comes only to steal, kill, and destroy. The more you have to steal, the more attractive you are as a target for the enemy. I do not want you to be afraid. Fear is NEVER from Me. I give POWER, love, and a sound mind. But I am trying to teach you how to handle wealth. Think about how I do it. The cattle on a thousand hills are Mine. Everything is Mine in heaven and earth. But do I let things run off to their own devices? NEVER! I keep watch over even the smallest sparrow. That is why all things are safe in My hand. So I want you to emulate Me when it comes to the wealth I have given you. I want you to take wealth management as seriously as I do. Remember that the first task I gave mankind was to steward the world I created. You were My original caretakers. So now, in this season, I need you to come back to the position I originally prepared for you. You are still My caretakers, and I need you to steward everything I give you to the absolute best of your ability—which is My ability, because Christ is in you. It doesn’t matter if you think you have little or much. What I am interested in is stewardship. If you take care of what I give you, I will give you more to steward. Remember that everything is Mine, and I am looking for faithful stewards to be My hands and feet on earth and help Me care for what belongs to Me. So will you help Me? Will you do what I have asked you to do, knowing that you own nothing and I own everything? Will you obey Me and keep your heart right before Me—as a steward, and not as an owner? And if you will, will you begin to keep watch over what I have entrusted to you as faithfully and diligently as I do? Wow, God. This word really spoke to me. Beloved Presence seeker, does this word speak to your heart also? If so, please leave a comment below. Let’s respond to the Lord and re-commit ourselves to Him to be His hands and feet in stewardship! Yes! Yes! Yes! We are auctioning our house May 11th to the highest bidder (this is not a foreslosure or short sale, just another way real estate is selling homes/businesses) and trusting the amount is what Abba says we need to be wealthy, prosperous stewards for this next leg of the journey. He has asked us to step out in faith and move to another state for His purposes. While we love our home and where we live, but we know answering His call is what matters most! We are excited and of course nervous to do a good job, but for the past 2 yrs we have been praying on this and will keep praying it all the way to completion and beyond daily. Thank you for this word and we would love any prayers for what Yehovah is going to do on May 11th for His glory, Amen! Thanks very much Jamie for your love and wonderful message. I have been praying concerning my finances for years now. I am living under the mercy of my wife to pay my bills. Please pray for me that every spiritual thief assigned from the pit of hell against my money must die by fire of God. That demonic snake that always show up when opportunity come must be destroyed altogether with demonic strongholds that are habouring my blessings. And all my blessings pending must be released supernaturally. Thanks once again, God bless. Thank you Jesus. I will be a good steward over all you have given me . I rebuke the enemy over my house. I am cheerful giver. That word is so on time for Gods people and me in this season. God is allowing me to connect with him even the more when it comes to finances, and yes God, I desire to be a good and faithful steward along with watching and seeking you in this season for what you have planned for me in keeping watch over your creation. Yes I accept this task with all my being. I will be the hands and feet for the Lord. Amen!!! I accept and will be faithful Steward and be your hand and feet on earth. I praise you Lord Jesus. Thank you Lord for allowing me to be one of your chosen ones. To you my dear sister thank you dearly. Much love, thank you always. Thank You! I will focus my daily prays on restoring my finances. Also, I want to be a better steward over the wealth that God is about to bless me with. Thank you very much for the word. I’m posting scriptures around my desk. Thank you , Jamie! You are a blessing to the body of Christ. God Bless you and your mininstry. Good Afternoon! You really heard from God for me, for sure in the word I just read from you about my finances. I have others in my life who did not give me God’s viewpoint about my present and future finances and wealth. However, God tapped you to direct and encourage me to do what is necessary to see definite breakthrough in my finances. God also used you to tell me that there is a future and a hope for me that is mine from Jesus in the area of my finances. Please keep me and my hubby, James, in your prayers that God will perfect that which concerns us in our walk with Jesus in every area of our lives—setting us free from all limiters and limitations, oppressors and their oppression in our lives, and that He will quickly clothe us in His light and glory. James and I are both called to wealth individually and unitedly by Jesus Christ for over 40 years now. We have been stewarding our finances with the help of the Lord all these years, but I can do better, in some areas. Thank you for your love and commitment to God and your audience that shows up in all your blogs, revelations, prayers, books and more. May God’s richest blessings be yours. Thanks for listening to God for me. If there is ever another time that you are given something for me from God, please do not hesitate to inform me. Thank you so much for that encouraging word . Overcoming a “poverty mentally ” is a huge mountain,but we know that He has told us to remove mountains . I just wrote a post about sparrows, I love watching them. To think that not one will fall without Him knowing. I know He never meant for death to reign, I’m agreeing with Gerri and pray Michelle a car, I need one too, and Bruce and Jaime, thanks Lord. More than a dozen times you have been right on target with prophetic messages.The other times have not commented because it is do profound that i meditate on it for days on end and honestly it is because i don’t know what to say in response. Thank You for this confirmation Holy Spirit! And for your obedience, sacrifice, and love, Jamie. Through a surrendered heart to Him, Abba has given me grace to be diligent in obeying Him regarding His holy first portion and offerings in gratitude. Still, with great shame, I confess, I have not been a very good steward of the rest. My heavy heart’s desire is to honor Him and to please Him. Need His forgiveness, rescue, and restoration so very desperately as I sense that now is the time to move forward in His revealed purpose for my life. No delay, no deviation, directly aligned with Holy Spirit – fully surrendered and heart postured to move in His Power. Early this morning, in response to Abba’s leading, I’ve just begun a special time of covenant communion and consecration with Him this month. 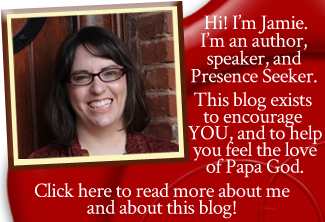 Prayerful for Jamie and all of you responding in these divine blogs. Thank you Jamie, this is awesome message from the Lord. It is point on. Praise God. Thank you Jesus. Thank you Jamie. God bless you. God is the God of the impossible so yes, I claim this prophetic word. I am going to join my prayers with those praying for a new car because my 15 year old car is dying and I work hard but as a single parent just cannot seem to climb that mountain to afford a new one for me and my little boy. So I am lifting us up for God to move the mountains, to cast out the spirits of poverty and renew our faith in this season of miracles and answer our prayers with His promise to honor and deliver. Our lips will sing of His goodness and we shall be stewards of His blessings and use our gifts to His glory. Love this word! Every day I try to remember to thank God for his abundance in our life and specifically thank him for paychecks, extra checks, etc. I also thank Him that when we commit with a cheerful heart to bring the full tithe into his storehouse he is faithful to open the floodgates of heaven and pour out a blessing so grand we cannot contain and desire to give even more back to him! I am so encouraged after reading this and seeing the comments. I pray for you and your needs, wants and desires are met according to his will. My 29 year old daughter needs a Miracle. She has had past health issues with heart and brain. She has disabilities and teeth issues. Needs specials doctor’s but dental insurance has been no help. Praying for divine intervention. Her teeth are extremely bad now and the cost is more then we have. 1st doctor issue, then dentist issue now financial issues. Trusting God to help us. And to be the stregth we need right now. Thanks for this. I will pray more often for everything, including in this area. Trusting he knows and sees everything. As long as I hear his voice directing me, I will be fine..He IS my provider.. When I was a child we lived on a farm and my parents raised cattle. If I had a need beyond the normal school needs or something for extracurricular activities, my dad would pray about the need and he would usually load one of the heifers and take her to the sale barn on sale day. He would come in that evening and lay the needed money on the kitchen table. Money was always tight for us and I realized even as a young child what a sacrifice that was, but I also realized the tremendous love that was behind the sacrifice. Now that I’m a single adult, I very often have needs that arise. My parents have moved to Heaven now, so when those needs arise I smile and ask my Heavenly Father that since He owns the cattle on a thousand hills if He could sell a cow for me. I know He laughs when I ask, and He never fails to provide! Thanks for this “on time” word. I have taken it to heart and will make this a part of my daily routine and prayer time! Thank you Jamie. That’s beautiful, Jena. Thanks for sharing that peek into the window of your life. May our Jireh delight even the more in your requests through childlike faith, and as is His way, may He blow your mind with the way He answers and provides. In Jesus’ name, Amen. God for a financial blessing to help with my finances after recovering from Stage 4 Head and Neck Cancer. Just now I was checking my email and got your prophetic word. I thank you for your encouraging words. GOD IS SO AWESOME! I pray that God will answer every prayer and every cry that has been given here this day. There is nothing to hard for God and there is nothing so impossible that He can’t do! Keep believing, keep praying, and stay in faith. All things are possible for those who believe! God bless you all! The Lord blesses me continualy through the words He sends through you. Thank you…have been thinking that maybe I am over zealous in my praying pattern. But today He has reassured me. Please pray for our family of 5 my husband is having a hard time finding a good salary job, he is definitely stressed out or bills are pilling. We just moved here to Florida from California. My husband is older with lots of experience in law and security. We almost lost are house . Please please lord my loving lord please provide my husband wayne with a great job so I can see him smile again lord I can’t see nothing happen to him. Please everyone pray for our family. Wow; very powerful!! Lord I will obey You and keep my right heart before you as a steward and not as an owner. Woow, I don’t have much and I have always known that God gave me for a reason and according to my power of being able to handle that. BUT this is my real mind; eye opener that I am not the Owner but the Steward over what He has given me. Praise be to God for the person that made me see this post which is now a Great blessing to my soul. Yes, from today onward I will and starting now, I am a steward and I praise God for all that he put to me to Guard for him. Much Praise Jamie. You are spot on!! Thank you for the prayer, I believe there will be a shift in my finances cause I feel it already. May God continue to Bless and Increase you miraculously for the Body of Christ. Since I pray your prayers I see God in my life. I am a cheerful giver and have been so when my finances shift, definitely I will give to those in need. Oh my goodness!!! How incredibly timely!! Seconds after I prayed about my finances, you post popped up in my email!!! God is such an awesome God!!! Thank you Father for your Word and yes Lord I will obey please be my Shepherd! This is a good word and I needed to hear this. Yes, I will commit to praying over my finances every day. And I will work diligently to be a good steward. I know I’ve looked at other people and thought, if I had that health problem, etc., I would be fervent in praying about that every day. And yet here I am not praying about my finances every day. I repent for lack of prayer and faith and I repent for judging others. Thank you Jesus, I receive it. Thank you Jamie! This is a timely word. My husband and I have just been praying over our finances. We do want to be good stewards over every area of our lives, money, home, ministry, time, help us to steward it according to your will and timing. Expand our horizons to see from your perspective Lord. Everything we have and all that we are it yours Lord. To you be the glory! This is such a inspiring statement from God. Yes … I will pray for my fnances every day and act as steward for anything I will receive as blessings because the Lord is the owner of evetything. Yesterday I heard word that God wants to promote faithful stewards in this opportune time. A “Matthew 25:21” kind of time. We are in a season where God will be exalting the lowly tree (Eze. 17:24) and this word has come as a confirmation that we are meant to keep watch over all that will be released. Thank you for post, it is surely a timely one. Thank you Jamie for this timely message on wealth and being a good steward of what God gives us. I just praying,like everyone else has been doing about my finances! I am willing to be a good steward of what is giving me and what is coming! I receive this word in the name of Yeshua!